Remote environmental monitoring is proof that you don't need an abnormally high midichlorian count to be a Jedi in the data center. These capabilities allow for immediate, real-time alerting when thresholds are exceeded. At 9:30 pm on a Saturday, you can be made instantaneously aware of a mission-critical rack that has surpassed a safe temperature by just a few degrees. Without making or receiving a phone call, you can turn to your spouse and deliver the coolest eight words that a facility manager could ever say: "I sense a disturbance in the data center." Alas, most data center managers already know what's behind the curtain: hard-wired climate sensors that have been painstakingly installed, sometimes throughout facilities that are tens of thousands of square-feet large. Sure, the ability to remotely sense disturbances is pretty cool, but after all the work that went into making that possible, it seems like you're barely breaking even with that Star Wars-esque payoff – until now. The idea of using wireless temperature and humidity sensors to track rack climate conditions is not new. However, it's becoming less "luxury" and more "strategic" in the data center. The most obvious reason to opt for wireless climate monitoring is time to deployment. As we've noted in former posts, ASHRAE recommends monitoring temperature at a minimum of six points in each rack: the top, middle and bottom at the points of air intake (front) and outtake (rear). Historically this setup has been accompanied by the annoyance of wiring these sensors into each rack. Bear in mind that six is a minimum, and dense racks that are set to operate at a higher base temperature may require Yoda-level climate models, because hot it has become in the high-density data center. The simple fix would be to go with wireless temperature monitoring, which, again, many have already done. Nevertheless, wireless monitoring infrastructure has left a lot to be desired. For instance, there's the question of range. Traditional gateways for data center monitors were typically limited to maybe 100 feet, which is more than enough for an X-wing-sized server room, but barely adequate for, say, a Millennium Falcon, let alone a Star Destroyer, or heaven forbid, a Death Star. There's also the question of bandwidth: How many individual sensors can each wireless gateway support? Until recently, the traditional limit had been tolerable. But now, wireless signal travels farther and supports more devices than ever before. May the Force be with your data center monitoring. Deploy faster than you can preorder tickets to "Star Wars: The Last Jedi." Save enough copper to build several new C-3POs. 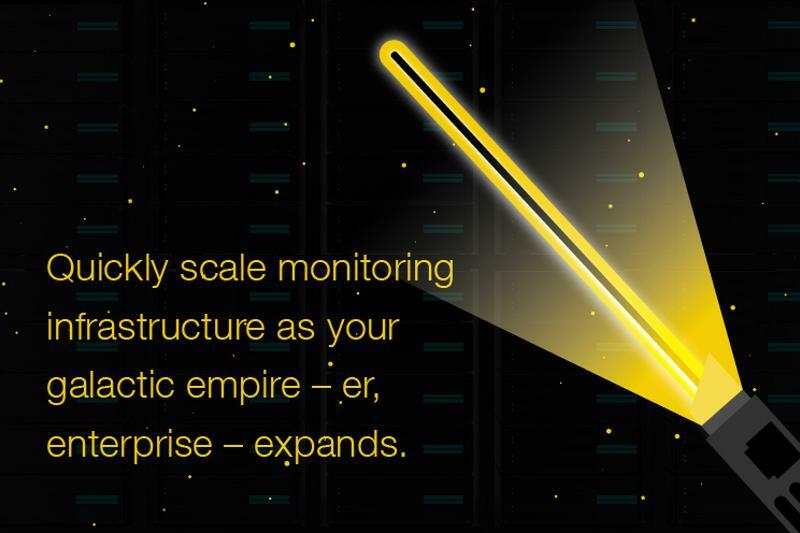 Quickly scale monitoring infrastructure as your galactic empire – er, enterprise - expands. Also, today's data center managers are under pressure to optimize the utilization of their facility resources. Often that translates to more servers and switches in smaller spaces. To accommodate these higher-density setups, other devices, including environmental sensors, should ideally have a small footprint. With one gateway covering 1,000 feet and 400 sensors, your CIO is less likely to say that he or she "finds your lack of space disturbing," during your next quarterly. Best-in-class wireless monitoring systems are designed to integrate with DCIM and other critical systems. They also have longer battery life, reducing the number of swap outs over the course of their operational lifespan. But most importantly, they're designed for your peace of mind. Because let's face it: You'd rather not be wondering if your data center's mission-critical racks are running hot on December 15. Deploy your data center monitors wisely, and you'll never have to wonder again.